In Metsäpoika ™ sauna you can stay overnight, wash yourself and enjoy the sauna experience in the middle of nature. Metsäpoika ™ keeps the buddy’s warm, sauna drinks cold and carries your hobby gear effortlessly. The Metsänpoika sauna was born in the small town in North Karelia Lieksa. Inspired by the backwoods of the wilderness, the bunk sauna has received a modest gray shape, that the rush doesn’t reach, and the anxiety does not overpower you. The garden sauna version is a fully bath-ready car towable sauna package without building permit obligations. The bunk sauna version is great for a hiker who loves sauna experiences in a natural environment. The Metsänpoika™ bunk sauna solves your accommodation problems in your nature hobby. Excellence lies in multi functionality. A handy sauna bench solution can be converted into a bunk bed for 2 people in a moment. You can have a sauna bath, wash yourself, dry your clothes, dine and stay in the same space. The storage capacity of the goods is 550L. After having a sauna bath, throw a couple of wood into the firebox, leave the door of the sauna open and cool down on the porch for a while. The sauna dries quickly. The personalized designed Metsänpoika bunk sauna is manufactured on request and delivered ready for use. The delivery time may vary depending on the number of orders. The size of the inside the sauna is 1.6 x 2.1m. There is enough room for 4 people to have a sauna bath at same time. The product has a 12 month warranty. The Metsänpoika sauna is suitable for 4 adults. The ventilation in the sauna is rich in oxygen. Every time you throw water on the stones, the steam stream draws in fresh air on the stove from outside. There is plenty of oxygen in the sauna and, therefore, you can enjoy the soft steam of the spectacular wood burning stove for even longer. Excellence lies in multi functionality. 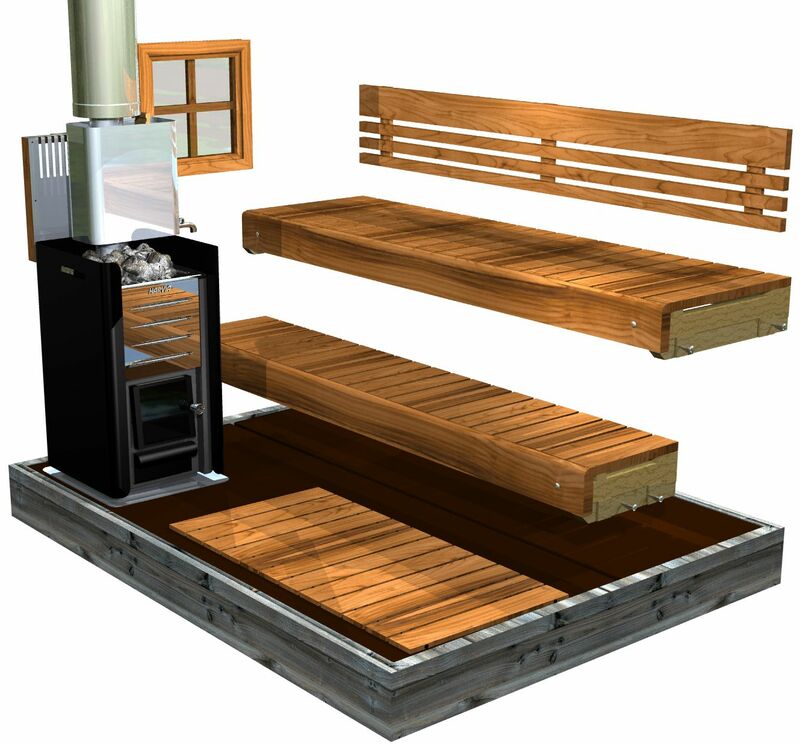 A handy sauna bench solution can be converted into a bunk bed for 2 people in a moment. The goods have plenty of storage space. Under the lower bench, the storage compartment has a capacity of 350L and outside 200L. You can cool off while taking a sauna bath or enjoy a terrace lunch at the end of your backpack trip with your friends. The wall-folding porch is easily accessible, but you can also lift it completely off if necessary. The bunk sauna is registered for road use as a towing device, so you can also use the sauna in your own yard. It is safe and easy to tow the bunk sauna. The Metsänpoika bunk sauna weights 750kg to 1300kg depending on the equipment. The permissible weights can be found in your car’s registration form. The Metsäpoika ™ garden sauna version is a fully bathed trailed sauna package without building permit obligations. Metsäpoika ™ sauna is registered as a towed device for road use. You can enjoy the outdoor sauna in your own garden or take it for summer cottage. Unbraked 750kg garden sauna can be towed by all-wheel drive car. Driving weights can be found on the registration document of your car. The trailer structures are durable hot-dip galvanized steel. The compact size of the Metsänpoika ™ sauna makes towing easier, and no extra mirrors are necessarily needed. The garden sauna does not need an annual inspection and the cost of road insurance is just a few dozen a year. The garden sauna is delivered on request and delivered ready for use. Metsäpoika ™ sauna size is only 1.6 x 2.1m, but 4 people still fit in the sauna. The washing takes place in a traditional way. The Metsänpoika™ garden sauna structure is made of uninsulated genuine wood and floor of durable film plywood. Without thermal insulation, the sauna stays dry and can withstand occasional use. The Metsänpoika™ saunas are equipped with a 20L water tank, a fire-proof fire wall, and a stainless chimney.